Our township is a charming, small town, with a rural atmosphere. It is dotted with beautiful lakes, golf courses, and recreational facilities. The township boasts an excellent school system, outstanding police department, and dedicated volunteer rescue squad and fire organization. Monday, Tuesday, Wednesday, Friday: 8 a.m. to 4 p.m. Thursday 8 a.m. to 6 p.m.
Andover residents, make an impact on your town and become more self-sufficient. 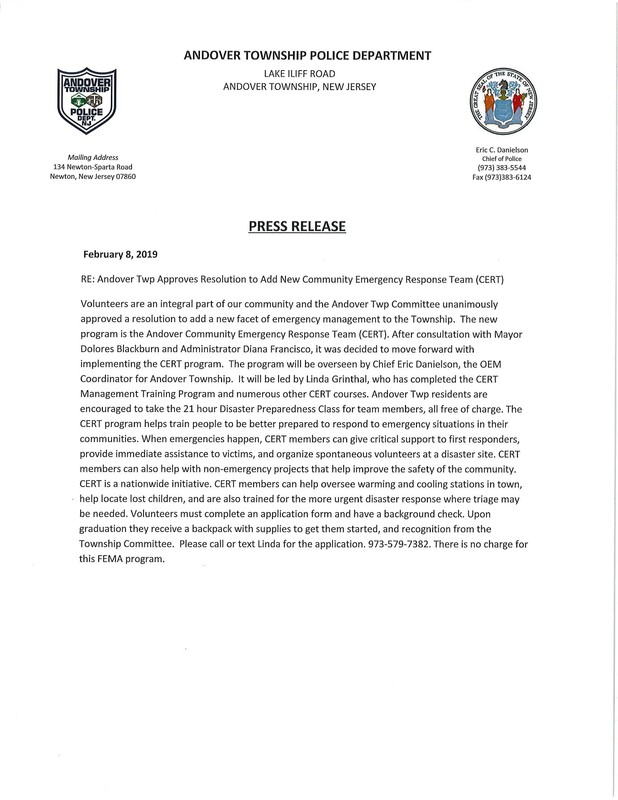 As a CERT member you can provide backup, assistance, and support to our First Responders and learn to be confident in an emergency or disaster within our community. Learn more or download the press release. Hours: 9 a.m. to 4 p.m.